Having established our straw-man to give us a strategic direction for the brand, our next stage was to explore how to express the brand visually. This meant looking at all the visual ingredients of the ‘brand toolkit’ — logo, colour, typography, imagery and an overarching idea to tie everything together. We looked at number of directions, but two ideas resonated with the team most. The first was based on the idea of discretion — using a vertical stroke that acted as a device to reveal and hide things from. The second was a colon device that represented the idea of convenience and time. In addition to the overarching idea, we also felt that the the logo needed to perform a couple of other practical functions. Firstly, we wanted to reinforce how the name is pronounced, therefore avoiding Shhh24 or SH 2-4. This was resolved through incorporating a separation between the SH and 24. Secondly, we wanted the logo to be responsive, meaning it could be reduced down to a very simple and discreet graphic identifier that could appear on any public-facing packaging. The idea being that the recipient would recognise that the package was from SH24, without the name (or more explicit symbol) stamped all over it. An early iteration of the concept was adopted by Unboxed so that the service had a visual presence for the alpha stage of the project. In the meantime, we explored the concept further by developing tonal ‘polars’ that we could test with clinic and non-clinic users to learn what worked and what didn’t. These ranged from the bright and bold to the more understated and sophisticated. 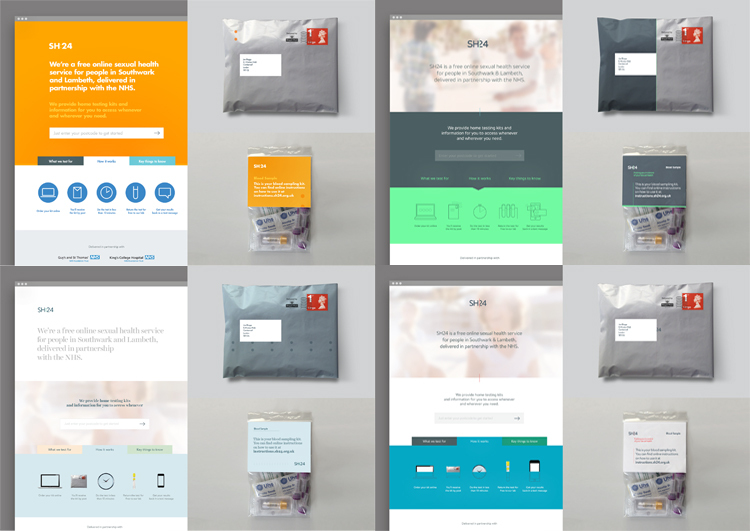 As the components of the brand can be quite abstract for people to grasp in isolation – we applied the four routes to three key deliverables in the user journey: the homepage of the website, the outer packaging and part of the kit itself. A number of strap lines were also tested from the functional to more emotional and benefit-led. We spent an afternoon at Camberwell clinic alongside sharing with other people in our network, unfamiliar with the project. We set-up a simple questionnaire on Survey Monkey to capture the results. People liked the vertical stroke route, but in our opinion, for the wrong reasons. They thought it was more professional (due to the fact it had more time spent on it) — however, our intention of the communicating the concept of ‘discretion' wasn’t really coming across. When shown the colon route, people made the connection with time and the idea of helping them solve their problem, faster. People preferred the bolder use of colour and an overall experience that felt more friendly than clinical. Interestingly, many people felt the use of bold colours more closely associated the service with the NHS as it felt familiar to other communication. Users liked the straight-talking ‘Sexual Health 24 hours a day’ as a way of clearly explaining what the service is and delivering the key benefit of offering convenient access. We then set about incorporating this feedback into the development of the beta brand — building on our initial work. As there were certain aspects of the routes that were equally liked, we developed two versions of the colon route, that were tonally different. The first option has been adopted for the beta version of the service, however further testing with users will help to shape this further going forward.